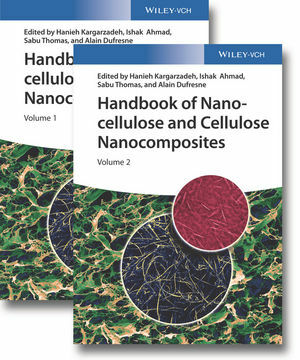 An up-to-date and comprehensive overview summarizing recent achievements, the state of the art, and trends in research into nanocellulose and cellulose nanocomposites. Following an introduction, this ready references discusses the characterization as well surface modification of cellulose nanocomposites before going into details of the manufacturing and the self-assembly of such compounds. After a description of various alternatives, including thermoplastic, thermosetting, rubber, and fully green cellulose nanocomposites, the book continues with their mechanic and thermal properties, as well as crystallization and rheology behavior. A summary of spectroscopic and water sorption properties precedes a look at environmental health and safety of these nanocomposites. With its coverage of a wide variety of materials, important characterization tools and resulting applications, this is an essential reference for beginners as well as experienced researchers. Hanieh Kargarzadeh is a post-doctoral research fellow at the Universiti Kebangsaan Malaysia (UKM) in Selangor, Malaysia. She received her MSc in organic chemistry from Islamic Azad University of Gachsaran, Iran, in 2007 and completed her PhD at Universiti Kebangsaan Malaysia, in 2013. Dr. Kargarzadeh has published a number of papers in high quality international journals and has been involved in a number of books as the author for different chapters. Her research interests lie in the area of nanocomposites, cellulose nanomaterials, and polymer blending. Ishak Ahmad is Professor at the School of Chemical Sciences and Food Technology, Universiti Kebangsaan Malaysia (UKM), as well as Head of the Nanocrystalline Research Consortia, under National Nanotechnology Directorate (NND), Malaysia. Prof. Ahmad has authored more than hundred research papers in international peer-reviewed journals and proceedings in the area of polymer composites, nanocomposites, polymer blends, polymer recycling and polymer hydrogels. Furthermore, he has written 3 books and contributed chapters to various books. Prof. Ahmad holds four patents. Sabu Thomas is the Director of the International and Interuniversity Centre for Nanoscience and Nanotechnology as well as full professor of Polymer Science and Technology at the School of Chemical Sciences of the Mahatma Gandhi University in Kottayam, India. His research interests include polymer nanocomposites, polymer blends, green bionanotechnological and nano-biomedical sciences. Prof. Thomas has authored more than 600 peer reviewed publications, reviews and book chapters, co-edited 53 books and holds 6 patents. Furthermore, he has received a number of national and international awards, including a Fellowship of the Royal Society of Chemistry, MRSI award, CRSI award, the Distinguished Professorship award form Josef Stefan Institute, Slovenia, and the Sukumar Maithy award. The H Index of Prof. Thomas is 77 and having a citation of over 25,5000. Recently, Prof. Thomas has been awarded Honoris Causa by the University of South Brittany, France. Alain Dufresne is Professor at the International School of Paper, Print Media and Biomaterials at Grenoble Institute of Technology, Grenoble, France. He has been a visiting professor in Brazil and Malaysia. His interests lie in the area of nanocomposites, heterogeneous polymer systems, as well as sustainable and renewable materials. Prof. Dufresne has authored more than 240 research papers as well as 40 book chapters and holds 7 patents. Furthermore, he is a member of the editorial board of several international scientific journals.